Peel and cut the butternut squash into 1-inch chunks. In a large skillet or pot, add a little bit of water, add the squash and pinch of salt. Cover and let cook at medium high heat for 10 minutes. Make sure to not over cook the squash. Remove squash from pot. Clean out the pot and add oil. Add chunks of pork loin and cook for 3-4 minutes per side. In a cup, mix chipotle seasoning and maple syrup. Return cooked squash to the pot. Add the chipotle and maple syrup mixture and let cook for 2 more minutes. You can serve it with a side of rice. In our house, weeknights are usually nights of simple meals. And my favorites are the ones that use only one pot and a few ingredients. That way I don't have to clean up too many things after dinner is done. 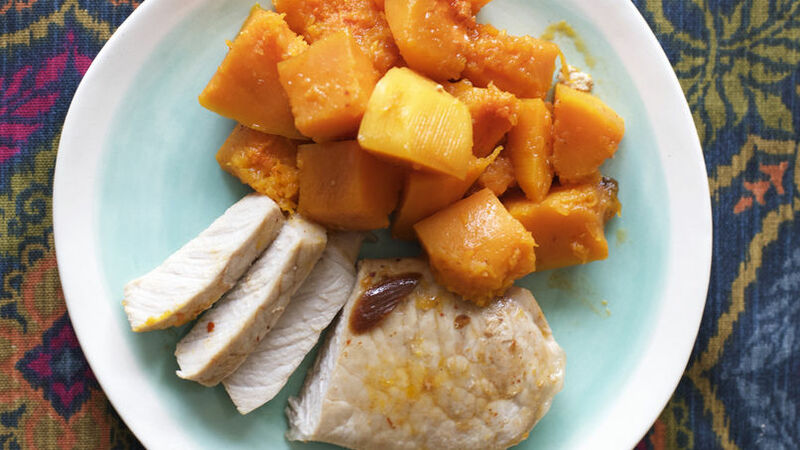 This pork and butternut squash recipe is perfect because it can be made quickly and using only one pot. It is also delicious and nutritious. I hope you try it.